If you are a morning person you must like to enjoy a healthy breakfast; because a good breakfast can surely make up your day. And if you are waking up in Dubai then you will definitely wish to have a grandeur breakfast that you have always heard of. Well, this is actually true, because Dubai is an opulent food arena where you can find the most luscious, scrumptious and delicious breakfast items served in enthralling ambiance with a royal treatment. Hotels and restaurants in Dubai not only offer an imperial dinner and lunch buffets, but breakfast and brunch too. Having breakfast in Dubai assures you to feel like a king starting his day, especially when you are feasting an extravagant breakfast buffet at one of the ritzy restaurants in Dubai. There are numerous restaurants and hotels that offer marvelous breakfast buffets in Dubai, where you can find lots and lots of choices. Starting your day with such variety and flavors is surely stimulating. 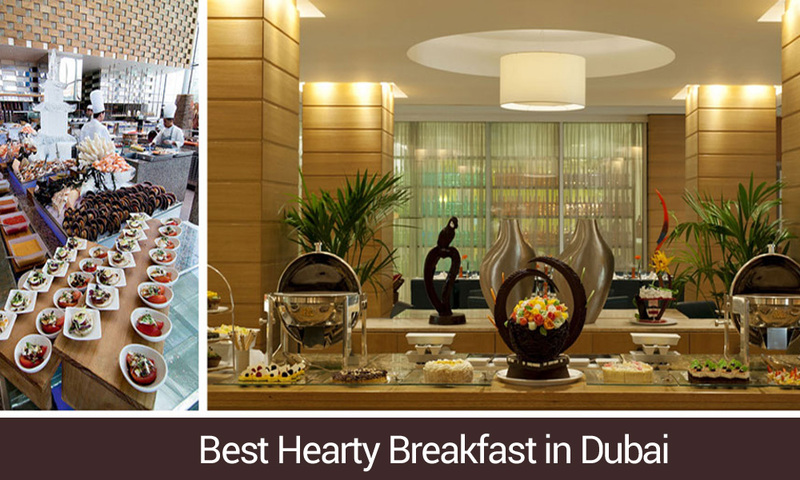 Encumbered with local and international cuisines; breakfast buffet in Dubai is offered at pretty affordable prices. There are a lot of places where you may find great breakfast, but to enjoy a good breakfast buffet in Dubai, you need to be a little acquainted with the places that serves you only the best food quality at the best price value. Here revealed are the best five breakfast buffet restaurants in Dubai, which offers you the best variety in breakfast, so pick one that suits your needs and tastes. Anise is the best place for all those who want to eat delicately, because their servings, platters, atmosphere, management and conducts are just so lacy. It is one of the premium breakfast buffet in Dubai with refreshing and peaceful ambiance. At Anise you will find all those tortillas, muffins, omelets and fresh juices that you have recently seen in your favorite Pinterest pins. Anise should be your first choice when it comes to have a delectable European, Middle Eastern, Arabian and Continental breakfast buffet in Dubai. Anise is located at the lobby level of Intercontinental Dubai Festival City. Prior reservations are recommended. The Market Café is yet another perfect place for enjoying a luscious breakfast buffet in Dubai. The place offer great variety and the taste, dining and ambiance is also very friendly and lively. However the place is usually busy, therefore a prior reservation is recommended. You may find a great international food selection here that is arranged by the national titles such as Turkish, Italian, and French etc. the Market Café is situated in Grand Hyatt Hotel at Sheikh Rashid Road – Dubai. Fazaris is Mediterranean restaurant and offer one of the finest breakfast menus in Dubai. Although you can find lots and lots of options to eat, but there omelet and Arabic spread, mushrooms sauce and truffle mash potatoes are to die for. The place has a great variety of cocktails, fresh juices, tailored omelets, muffins, sandwiches and chef special cuisines. Fazaris is located at the Address Downtown between the Sheikh Zayed Road and the Doha Street. Sloane’s is one of the best priced breakfast buffet in Dubai for locals and visitors. You may enjoy the casual ambiance of the place with their delectable and fresh breakfast and drinks. Sloane’s offers great variety of international cuisines perfectly cooked to enhance the food delicacy. The food and environment of Sloane’s restaurant are amazing. Sloane’s is located in Grosvenor House at Al Sufouh Road – Dubai. Kitchen 6 @ JW Marriott Marquis Hotel is one of the finest all-day dining place that features a marvelous breakfast buffet in Dubai including international, Asian, Middle Eastern, European and Indian buffet. Kitchen 6 celebrates the best flavors from all over the world at affordable prices. The breakfast is served between 6 am to 11 am and costs you around AED 140 per person. Kitchen 6 @ JW Marriott Marquis Dubai is located in the Level 1 of JW Marriott Marquis Dubai, Business Bay at Sheikh Zayed Road- Dubai.